just picked it up not to long ago and am slowly working on it as my back permits, disabled vet. Can not wait till it is on the road... I have new sheet metal coming and some I have to go pick up in Cali. Will be getting cortina straus and so forth, may do disk brakes on the back also. Doing resto mod so I will be swapping the motor for maybe a 3TC 1800cc and run bike carbs like i did on my chevy luv. here is a little video i have so far and my flicker page. Good for you. Sounds like you know what you are doing, so welcome to you and your new (soon-to-be) ride. Keep us posted. Nice project you have there. Ay updates? no updates yet. Just got my bead roller set up and did some practicing with it but I am going to motorize it first before I start making parts. well had a nice trip to lodi CA to pick up some good sheet metal for my car . 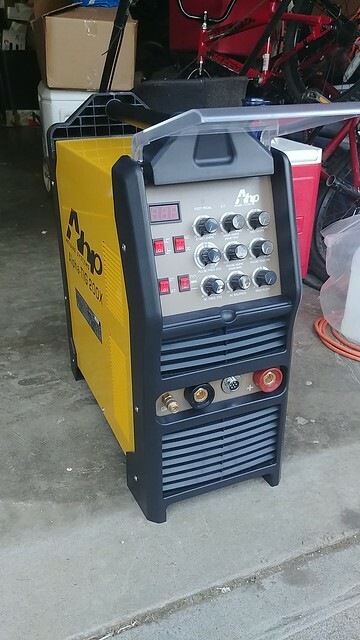 Now I can start on some patch work as my new welder will be here next week also, the AHP AlphaTIG 200X seem like it will do the job. got it all back to the shop and now just waiting on team deville for my order to ship, taking long time. also new tig welder showed up so I am happy. Would love to have one of those, gonna try my hand at oxy/ace next I think though.